Helen Breil sure has her fans. 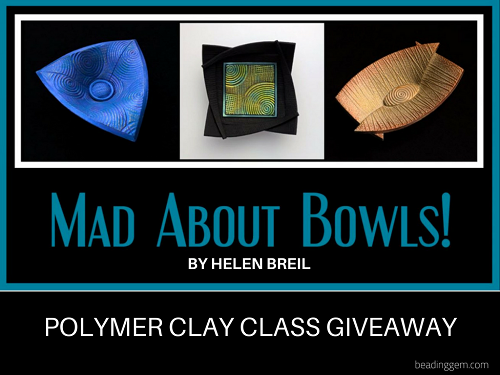 Polymer clay enthusiasts really liked her Mad About Bowls giveaway which I featured last week. Debbie, one of her fans said, "Helen Breil is an an amazing shining star in the polymer clay world. Excellent tutorials, and so much free, ACCURATE advice too!" Well, I happen to agree - friend or no! Aims had a good point. She said, "My brother is a potter. Creating bowls like these and then glazing them with such patterns and colors would take and extraordinary amount of time and patience. The benefits of all the colors of polymer clay and how easy it is to fire speaks volumes when you look at Helen's work. The possibilities are limitless." Who won? I numbered all the eligible entries and got the random number generator over on random.org to do the picking. The lucky winner is Enid Winder! I do not have your email. Please email me back pearl@beadinggem.com asap before next Monday to claim your prize. Didn't win? Check out her Mad About Bowls class here.